How to Change the World screens in the green giant’s birthplace; Milkman Reid Fleming is still a Hollywood pariah. In the 1970s, Vancouver was a hotbed of ecology-minded hippies, draft-dodgers, pot smokers, and acidheads. 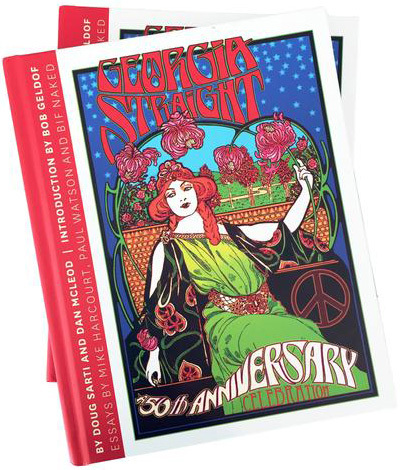 The Georgia Straight in those years was already a well-established underground weekly, having survived numerous attempts by the city’s frequently apoplectic mayor to harass it, muzzle it, and shut it down since its inception in 1967. Out of that decade’s stew of psychedelia-tinged music, philosophy, and political activism came two cultural artifacts that have persisted for four decades, albeit with varying degrees of relevance: the world’s largest and most effective environmental organization, and a lovable asshat of a milk-truck driver. Those constructs, Greenpeace and the fighting-mad comic-book character Reid Fleming, World’s Toughest Milkman, share two things in common other than their city of origin: close ties with the Straight in their formative years, and inclusion as film subjects in the 14th edition of the DOXA Documentary Film Festival lineup (April 30 to May 10). Greenpeace’s fest showcase comes in the form of How to Change the World, a new feature doc by U.K.–based director Jerry Rothwell. The 112-minute film by the maker of Town of Runners explores the ragtag beginnings of today’s massive activist NGO through the words of its first leader, Bob Hunter, and it has been awarded DOXA’s opening-night spot. Reid Fleming’s latest public exposure is courtesy of a 12-minute sparring match of a short by Fleming creator David Boswell’s nephew, Charlie Tyrell. Its title, “I Thought I Told You to Shut Up”, is the truculent truck jockey’s trademark expression, first seen in a full-page Straight cartoon in 1978. Other noteworthy films among the more than 90 scheduled to be screened during the 11-day event include the midfest special presentation Yes Men Are Revolting, and the final documentary by genre giant Albert Maysles, Iris—slotted in, fittingly, as the closing-night gala. Rothwell confesses to a bit of trepidation as he gets ready to accompany How to Change the World to Canada for Toronto’s Hot Docs festival and DOXA immediately after. Speaking to the Straight from Lewes, England, Rothwell explains that although his film has already been screened on the U.S. festival circuit, Vancouver has special meaning, even when compared to Hogtown’s mammoth doc bash. “DOXA is the really crucial one, because it’s taking the film to where Greenpeace was conceived,” he says. Honours for his movie to date include best-feature-film awards at both the Portland and Sebastopol fests, and Sundance’s Candescent and special-jury editing prizes. One of the reasons Rothwell’s documentary is impressing audiences and critics alike is his use of spectacular and previously unseen footage from the earliest days of Greenpeace, shot during its initial ocean voyage to protest atomic testing in 1971 by the U.S. in Amchitka, Alaska, and its subsequent antiwhaling forays against the Russians in the North Pacific. “That material in the first voyage, there’s great stuff there,” Rothwell says. He explains that a huge cache of old Greenpeace International films and records in Amsterdam sparked his interest in making the feature. As he researched further, he came across writings by Bob Hunter, the former Vancouver Sun columnist (and then-pseudonymous Straight writer) who became the reluctant first leader of Greenpeace. Vancouver itself is one of the stars of the film, providing a nostalgic ’70s backdrop (mountains, False Creek, Jericho Beach) for many of the scenes. As for the people, headbands, bell-bottoms, peasant skirts, enormous mustaches, and long hair ruled the day. And footage from the Amchitka and antiwhaling voyages on the 25-metre halibut seiner Phyllis Cormack contains two striking and pivotal episodes that both informed an abrupt change in focus for Greenpeace (from anti nuke-testing to antiwhaling) and confirmed a life’s work for Straight writer (and, later, Sea Shepherd Conservation Society founder) Paul Watson. The former came about when Hunter and a few brothers-in-arms toured an abandoned whaling station on Alaskan soil. Amid stunning natural beauty, the scene segues from acid-infused meadow frolicking to the ghastly discovery of H. R. Giger–esque monster bones and the decaying skeleton of assembly-line death. “He [Hunter] references this as the point at which he thought of kicking off the whale campaign,” Rothwell says. Watson’s epiphany came after he jumped onto an illegally killed baby sperm whale floating in the open ocean. The footage leaves no doubt as to the former merchant mariner’s state of mind. Those moments changed his life, as he states in the film. Hunter, the master media manipulator, sent the strong shots worldwide, causing a sensation. A protracted falling-out between the harried Hunter and the headstrong Watson came to a boil with the help of controversial early Greenpeacer Patrick “eco-Judas” Moore. Rothwell devotes a good chunk of time to the frayed dynamic between Moore and the future Sea Shepherd leader, which, ultimately, led to Watson’s dismissal from Greenpeace. “It’s kind of astonishing that any organization could have the two of them working together,” Rothwell observes. “It’s amazing that these people were in the same place and experiencing the same things. The short film “I Thought I Told You to Shut Up” surveys Reid Fleming fans such as Dave Thomas, Matt Groening, Ed Asner, and former Straight editor Bob Mercer as it delivers a brief history of the Hollywood travails suffered by David Boswell, the creator of the pugnacious working stiff at Milk Inc.
Boswell’s troubled relationship with a major Hollywood studio that wined and dined him with the promise of a feature film in the late 1980s and then dumped him after purchasing his character’s film rights is the stuff of legend among Reid Fleming fans. “One of the worst days of my life was to realize I don’t own the rights to my own comic book,” Boswell (who created this week’s Straight cover) laments in the film. Theories and rumours abound regarding Warner Bros.’ stubborn refusal to mount the production during the intervening 27 years. In the film, two enthusiastic would-be producers from those halcyon days and a former studio exec put it down to the studio head just not getting the character’s appeal. That shelving of what many considered a potential blockbuster came despite the rumoured or real interest in playing the title role expressed by stars such as Robin Williams, Jack Nicholson, Bob Hoskins, Bill Murray, Jim Belushi, and Jon Lovitz. Other than hinting at a few possibilities, Boswell doesn’t want to dwell on possible future film prospects for his most famous character. Speaking by phone from his Vancouver home, he tells the Straight he’s focusing on keeping Fleming alive in print. How to Change the World screens at 7 p.m. at the Playhouse on Thursday (April 30); “I Thought I Told You to Shut Up” screens with “Seth's Dominion” at the Cinematheque at 7 p.m. on Friday (May 1) and the Vancity Theatre at 3:30 p.m. on Monday (May 4) as part of the DOXA festival.